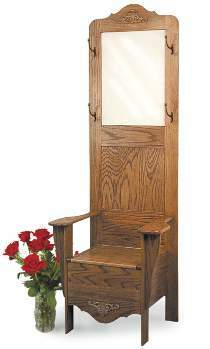 Features a built-in chair so you can sit down and take off your shoes or boots. Decorative coat hooks let you hang up your coat and hat. Handy mirror so you can make sure you’re looking your best. Compact design takes up very little floor space in hall or entryway. Under seat chest provides additional storage. Patterns drawn FULL SIZE. Project measures 28"W x 78"H x 20"D. Order hardware below. Hall Tree Chair Hardware contains four Coat Hooks, two Oak Embossed Wood Ornaments and one Brass Piano Hinge with Screws. Project plan, wood and wood finish are not included.